THE COURTYARD CLUB 2018. FREE, LIVE LOCAL MUSIC. 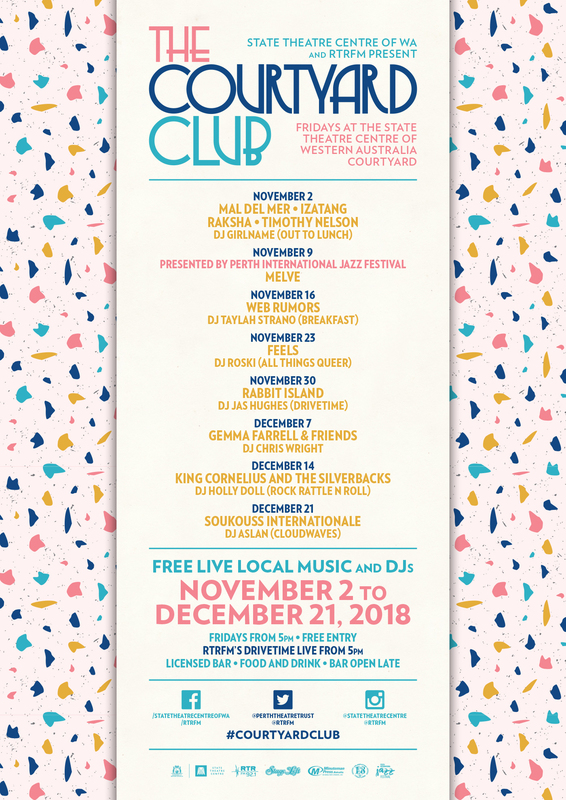 State Theatre Centre of WA and RTRFM are proud to announce the return of The Courtyard Club, a free 8-week concert series taking place every Friday evening from 2 November to 21 December in the State Theatre Centre Courtyard. RTRFM are pleased to be teaming up with State Theatre Centre of Western Australia for the fifth year to bring live, local music into the heart of Northbridge at the iconic State Theatre Centre Courtyard. The Courtyard Club has become the perfect place to start your weekend with friends while experiencing live radio and local music for free. The series opens on Friday 2 November with four hours of live, local music broadcast on RTRFM. Head on down for the neo soul sounds of some of the city’s newest exports, Mal de Mer, Izatang, RAKSHA and the songwriting genius of Timothy Nelson. Plus, hang out with Out To Lunch’s DJ Girlname well into the night. Throughout November and December join RTRFM every Friday night from 5pm for live radio, local music and RTRFM DJ’s. On 9th of November we are teaming up with the Perth International Jazz Festival to bring you a very special performance from local jazz super group Melve, followed by a paid performance as part of the the festival. Also catch the sounds of psyche folk masters Web Rumors, the electronic wizardry of Feels, the delightful and mesmerising Rabbit Island in a special intimate and solo set, more jazz wonders from super group Gemma Farrell & Friends – lead by the amazing Gemma Farrell on Sax, the jungle boogie of King Cornelius and The Silverbacks and to finish things off the afrobeat party vibes of Soukouss Internationale. The Courtyard Club is an all-ages event with licensed bar and food options, making it the perfect meeting place to celebrate the end of the working week. Enjoy free live radio from RTRFM and local music under the stars in the beautiful surrounds of the State Theatre Centre Courtyard every Friday from 2 November ‘til 21 December. Courtyard Club is proudly presented by State Theatre Centre of WA, Perth International Jazz Festival and Little Creatures – Celebrating 18 years in November. Little Creatures is proud to be partnering State Theatre Centre of WA and RTRFM for The Courtyard Club- a free 8-week concert series taking place every Friday evening from 2 November to 21 December in the State Theatre Centre Courtyard. Help us celebrate 18 years with live, local music, good times and good beer!